As many of you know this year is Canberra’s centenary. 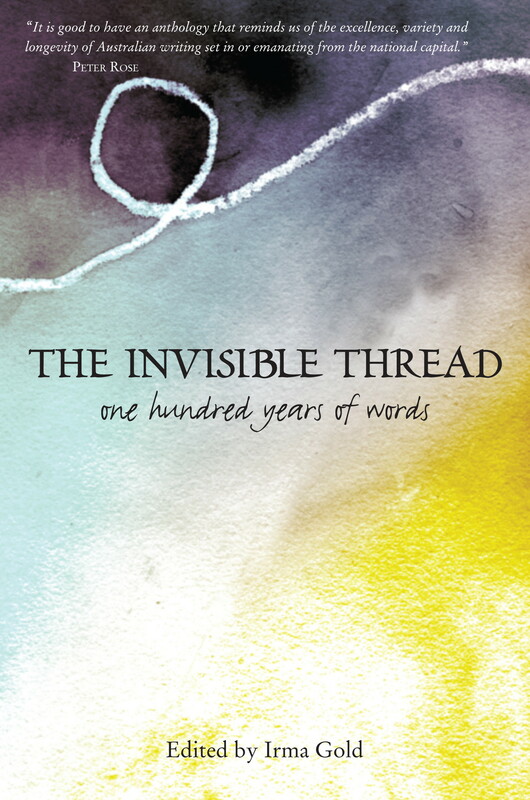 And, if you’ve been reading this blog, you are sure to have seen a mention or two (or more) of the gorgeous centenary anthology, The invisible thread, edited by Irma Gold. If, however, you don’t know what I’m talking about, click on the following links to see my post on its launch, my review, or my description of the beautiful Woven Words event inspired by it. Hands up if you’d like a copy. Well, now’s your chance. The gorgeous, generous Irma has two copies of the book that have been signed by over 30 of the (still living) authors as well as by the editor (Gold) and the illustrator (Judy Horacek) … and has apparently been wondering what to do with them. To my astonishment, she asked me whether I would like to run a giveaway through my blog. Would I what? The give-away is being timed to coincide with the last of the many events Irma has organised to promote the book – AN EVENING OF READINGS at the Paperchain Bookstore here in Canberra on Wednesday 28 August. It’s free but RSVPs are requested. Do consider going if you are in town. It will be great. Eligibility: The giveaway will be open to Australian and international readers, with ONE copy to go to an international reader, and ONE to an Australian reader. I will use a random number generator to identify the winners. How to enter: Leave a Comment on this post, and state which country you live in so I can place you in the right giveaway group. I’d love to hear why you’d like to have the book – but it’s not essential. The fine print: Entries will close at midnight AEST on 31 August. If you win, you must email me with a postal address by the deadline that I advise in the post announcing the winners. I will redraw a new winner if the deadline isn’t met. I can’t thank Irma enough for this offer … and hope those of you who lurk here won’t be too shy to enter. This is a booklover’s treat that doesn’t come around often. Well, WG – re Book Giveaway – I’d like to put my hand up – and I live in Australia. Why? Anthologies for a period in my life were a focus of my reading/collecting – then I put together a couple of anthologies (one a text/anthology) for OUP in 1990 – Australian being the common link – but ranging from Indigenous writers through Anglo to other culturally/ethnically diverse Australian writers. I like the way one selects and arranges – the pieces as you say which converse with those alongside – setting up other dynamics. But whether my name comes up or not – what a generous gesture from the editor – Irma GOLD. Thanks Jim … I’ve got you on my list! And I wish you luck in the random draw. I’m sure you’d enjoy it. Australian. Love short stories. Love anthologies. I’ll keep my fingers crossed that my number comes up. Great Karen Lee … I wish you luck too. It’s a great read for people who enjoy short pieces. Hi Sue, on your recommendation I obtained a copy of The Invisible Thread from the library and really enjoyed the stories. I would treasure a copy signed by Irma Gold and most of the authors. I am -prepared to win it; I know my address and I have a special place in my Australian bookcase for it to occupy. LOL Meg … Then you are clearly a worthy winner too. Irma would be thrilled to know that someone who has read it would love this special copy. Would love a chance to win this book. My country is Israel. Great Geraldine, nice to hear from you … I’ll add you to the overseas list and wish you luck. I am an international entrant from the USA. I have been quiet of late but, when you call a book essential, I want it. Thanks (while not presuming I will be one of the lucky ones) to wonderful you and the generous Irma Gold! Oh, I was just thinking of you the other day Kerry … Thrilled that you are around and have thrown your hat in the ring. Good luck! My apologies, but a hectic schedule has reduced me to lurking more than commenting and, as you may notice, has contributed to my not blogging at all for too long. But I am here and reading, if lurkily…lurkishly…er, quietly. It’s good to know you’re around, Kerry … though I do miss your wonderful reviews. You always offer wonderful perspectives. Glorious words AND Judy Horacek! Count me in (to the draw)! P.S. Canada/international. BUT YOU KNOW THAT. Okey doke will do .. We’d expect a WayChoc review of course! Great John, that’s a lovely offer. I presume this means you’re in Canberra!! I guessed, John. Thanks for the confirmation! I’ve also read this anthology, and would love to own my own copy. I enjoyed reading about both the Canberra I know, and the Canberra that exists just outside my consciousness. Anthologies are like a series of captured conversations. Great Jennifer … Sounds like you deserve your own copy. Love your description of anthologies. I think it’s particularly true of this one because of the order Irma created … The pieces do converse with each other. Would love to have an autographed copy – please include the number for this comment in the draw for the Aussie list! I have put my hand up to be involved in editing the Bangalow Writers Group’s forthcoming anthology (proposed launch at the Byron Bay Writers’ Festival 2014) and am keenly reading a variety of anthologies with short stories and poetry in the mix. Hopefully some 100-word microfiction drabbles that I introduced to the group as a creative writing format will make the cut. Will do Alexandra … Sounds as though you’d be a worthy winner! Including some dribbles would be great. LOL – drAbbles (though dribbling is an approved activity given the right external stimulus!) Occasionally I do mistype my own wordpress blog as ‘squeakythings’ instead of squeakythongs..
Other drabbles Jim but perhaps you know that … I wrote Monday musings on them a while ago but autocorrect beat me this time! I typed drabbles, Alexandra …. Didn’t notice the darn autocorrect but it does make one laugh, sometimes, doesn’t it? Auto-correct is our preview of a world dominated by free-range computers. Catherine in Italy. I remember your review of this evening – a music lover’s delight? And I’d be keen to savour Australian literature that is less city-bound than what one often stumbles across. Love the macro-micro vision. Oh good. Catherine … That was an evening to remember. I’ll happily add you to the OS list. Hi Sue – Although I have always loved reading Aussie lit, since leaving Australia 17 years ago I have felt a little disconnected re the latest authors and Oz Lit happenings. Since discovering WG, and your recommendation of Reading Matters, I feel more connected and my TBR pile keeps increasing! My book group will be discussing The Rosie Project next as a result of your review! I now live in Switzerland and would love to be able to show off the Invisible Thread to my friends and colleagues. Good to hear from you again Glenda. I’ll add you to the OS list which seems to include a few Aussie expats! Text will be thrilled to know that my review of Rosie’s project has resulted in an OS book group read … Thanks for letting me know. You know where I am (warm at the moment, blue skies, crinkled purple mountains, carparks baking like buns) and I am going to put up my hand for this book in the name of small cities everywhere. I do indeed DKS and will add you to the OS entrants. I e just landed in Madrid .. At 7pm it was 39 deg C.
Oh, and go small cities everywhere.